For an exceptional truck buying experience, come into Greenville, TX's own Greenville Chrysler Dodge Jeep Ram, now home to the new Dodge Ram 1500. 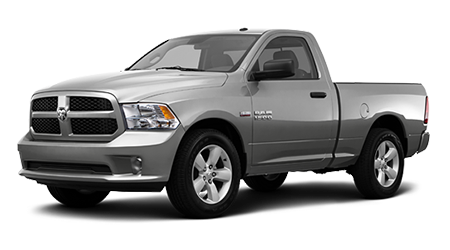 The 2015 Dodge Ram 1500 is the first introduction into the Ram line-up of powerful pick-up trucks, and as such, comes with a lot of familiar features that you'll find only on other Rams. The Ram 1500 is designed with businesses, ranchers, farmers, and individual drivers (with lots to do) in mind, and offers a number of different configurations and layouts to ensure that there's something for every need and budget. The new Ram 1500 is available with a long or short bed in a Regular, Quad or Crew Cab. Available trim packages include the Tradesman, an all-work, low price truck that includes a Class IV hitch and USB auxiliary. The Express trim adds on carpet flooring and body colored bumpers, but removes the hitch. The SLT adds an exterior chrome trim and upgraded infotainment system with a touch screen, while the SLT Outdoorsman is off-road ready. The Sport and Laramie trims are the top-of-the-line, with the Sport including the SLT options plus a Hemi V8, heated seats, and a larger touch screen. The Laramie boasts impressive leather seating and a ten speaker sound system! Standard equipment for the new Ram 1500 at Greenville ranges from a 3.6-liter V6 (with 305 horsepower), two-wheel drive, and six or eight speed transmissions depending on the standard engine you get with your trim level (standards, here, vary). An optional HEMI V8 5.7-liter engine that nets 395 horsepower is available this year, and eco-conscious drivers will love a powerful but fuel-efficient 3.0-liter Turbo-diesel option that nets 420 pound feet of torque. Four wheel drive and automatic FT AWD are optional upgrades and best suited for those who plan to do a lot of lugging. No matter what you intend to use your new Ram 1500 for, or how you wish to configure it, rest assured that Greenville CDJR's got you covered, whether you're in Rockwall, Commerce, or Garland, TX. Come in today for a test drive of the new Ram 1500, and see for yourself why this pickup keeps racking up all the awards.